Today, produce leader, Tanimura & Antle, Inc. announced donations to two North American organizations whose work is to offer healthy school lunch programs. Let’s Move Salad Bars to Schools will be able to place new salad bars in five schools in the U.S., and the Canadian Produce Marketing Association (CPMA) can give the Freggie Friday™ In-School Program curriculum to ten elementary schools in Canada. Let’s Move Salad Bars to Schools is a public health campaign that provides salad bars to schools across the country. The United Fresh Produce Association is one of the founding partners. The Freggie Friday™ In-school Program is designed to teach kids, in a fun and engaging manner, about the importance of eating fruits and veggies. “We very much appreciate Tanimura & Antle’s ongoing support for Let’s Move Salad Bars to Schools. Two of the schools receiving new salad bars donated by Tanimura & Antle are Harvest Preparatory Academy K-12, Yuma, AZ and Harvest Preparatory Academy K-3 in San Luis, AZ. Every day, hundreds of these students will now be able to enjoy more fresh fruits and vegetables during lunch ----right in the heart of our nation’s winter lettuce and vegetable growing area,” said United Fresh vice president of nutrition and health Dr. Lorelei DiSogra. “To date, Let’s Move Salad Bars to Schools has donated salad bars to over 1,035 schools in 45 states, thanks to generous contributions from companies like Tanimura & Antle,” noted DiSogra. “The Freggie Friday™ and Freggie™ Children’s Programs are initiatives that we at CPMA are very proud of. We’re encouraged by Tanimura & Antle’s support which will enable us to continue to challenge Canadian kids and affect behavior change early.” commented Ron Lemaire, President of the Canadian Produce Marketing Association (CPMA). A fall seasonal packaging promotion on Tanimura & Antle Artisan® Lettuce brought attention to the Let’s Move Salad Bars to Schools initiative and the Canadian Produce Marketing Association’s (CPMA) Freggie™ Children’s Program. 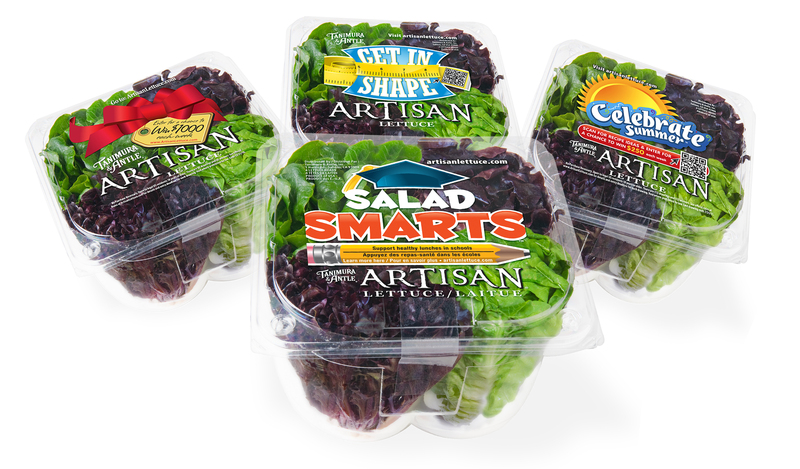 This promotion, Salad Smarts, was the fourth seasonal packaging promotion for Artisan Lettuce in 2011, and the first that featured a cause marketing initiative. Tanimura & Antle is an industry leader whose commitment to premium quality produce has remained strong since its formation in 1982. The Tanimura & Antle families combine more than 50 years of experience and knowledge to establish a produce company unrivaled in its quality products, innovation and dedication to growers, customers, consumers and employees. Today, as one of the largest independent lettuce growers in the United States, Tanimura & Antle farms more than 30,000 acres of rich, fertile farmland and ships a full line of premium fresh produce products throughout North America, Europe and Asia. For more information, please visit http://www.taproduce.com and http://www.artisanlettuce.com. Founded in 1998, the United Fresh Produce Association Foundation is a 501(c)(3) not-for-profit organization committed to meeting the public’s needs for an abundant supply of healthy, safe and affordable fresh fruits and vegetables. The Foundation is dedicated to increasing the availability of fresh fruits and vegetables to children as a critical step in combating childhood obesity and launching a lifetime of healthy choices. To assist industry members in meeting these goals, the Foundation offers educational programs, leadership development, public outreach, and industry training through four different Centers -- Center for Leadership Excellence, Center for Nutrition and Health, Center for Food Safety and Quality, and Center for Global Produce Sustainability. For more information, visit http://www.unitedfresh.org or call 202-303-3400. Based in Ottawa, Ontario, the Canadian Produce Marketing Association (CPMA) is a not-for-profit organization that represents companies that are active in the marketing of fresh fruits and fresh vegetables in Canada, from the farm gate to the dinner plate. CPMA's vision is to enable and lead the produce industry by enhancing the market and facilitating trade of fresh fruits and vegetables for its more than 760 international and Canadian members who are responsible for 90% of the fresh fruit and vegetable sales in Canada. For more information, please visit http://www.cpma.ca.